Tongue - Hyperkeratosis in a female F344/N rat from a chronic study. The keratin layer on the surface of the tongue is thickened (arrow). Tongue - Hyperkeratosis in a female F344/N rat from a chronic study (higher magnification of Figure 1). 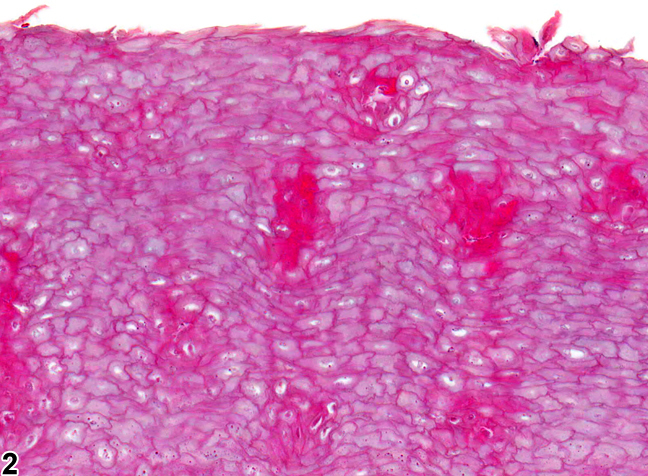 The hyperkeratosis is orthokeratotic, lacking nuclei. Hyperkeratotic lesions, although very common in the forestomach, are rare on the tongue in NTP studies. Hyperkeratosis (thickening of the stratum corneum) occurs in two forms: orthokeratotic ( Figure 1 and Figure 2 ) or parakeratotic hyperkeratosis. In orthokeratotic hyperkeratosis (sometimes referred to as orthokeratosis), the dead keratinocytes are anuclear, whereas in parakeratotic hyperkeratosis (sometimes referred to as parakeratosis), the dead keratinocytes have retained pyknotic nuclei. 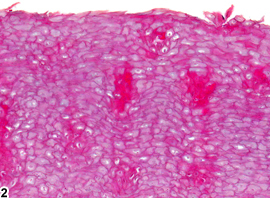 Hyperkeratosis often accompanies squamous epithelial hyperplasia. 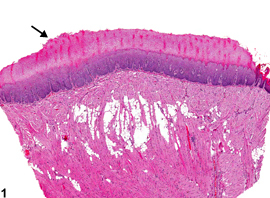 In general, hyperkeratosis associated with hyperplasia of the underlying squamous epithelium is not diagnosed separately but is described in the pathology narrative as a component of the hyperplasia. However, if the hyperkeratosis is prominent or is disproportionately increased compared with the degree of hyperplasia, or if it occurs in the absence of epithelial hyperplasia, then it should be diagnosed and graded. Grading should be based on the thickness of the keratin and the amount of tongue surface affected. The pathologist should use his or her judgment in determining whether or not the hyperkeratosis should be diagnosed separately. When diagnosed, the term "hyperkeratosis" should be used for both the ortho- and parakeratotic forms (i.e., do not use the term parakeratosis). Hargis AM, Ginn PE. 2007. The integument. In: Pathologic Basis of Veterinary Disease, 4th ed (McGavin MD, Zachary JF, eds). Mosby, St Louis, MO, 1107-1261. Kaplan I, Hochstadt T, Dayan D. 2002. PCNA in palate and tongue mucosal dysplastic lesions induced by topically applied 4NQO in desalivated rat. Med Pathol 7:336-343. Leininger JR, Jokinen MP, Dangler CA, Whiteley LO. 1999. Oral cavity, esophagus, and stomach. In: Pathology of the Mouse (Maronpot RR, ed). Cache River Press, St Louis, MO, 29-48.